In kidney transplant recipients, despite significant improvements in short-term renal allograft survival,  long-term graft survival is still an ongoing concern. Proteinuria after kidney transplantation is common and is associated with reduced allograft survival. , A thorough systematic review of RAS inhibitors in kidney transplantation demonstrated reductions in proteinuria, hematocrit, and glomerular filtration rate in renal transplant recipients with RAS inhibitors. However, there was insufficient data to determine the effect on patient or graft survival. Recently, the findings from a multicentre, double-blind, randomized controlled trial (RCT) of ramipril versus placebo in 213 kidney transplant patients showed that treatment with ramipril did not lead to a significant reduction in allograft failure in proteinuric kidney transplant recipients. Unfortunately, the investigators did not achieve target sample size, resulting in a potentially underpowered study. Therefore, we conducted this systematic review and meta-analysis to comprehensively accumulate all allograft survival data and pool results to evaluate the effect of RAS inhibitors on kidney allograft survival. Two investigators (WC and CT) independently searched published studies and conference abstracts indexed in MEDLINE, EMBASE, the Cochrane database, and ClinicalTrials.gov from inception through February 2016 using the following words: "Angiotensin-Converting Enzyme Inhibitors," "Angiotensin Converting Enzyme Inhibitor," "ACE inhibitor," "ACEIs," "Angiotensin II Type 1 Receptor Blockers," "ARB," "benazepril," "captopril," "cilazapril," "delapril," "enalapril," "fosinopril," "imidapril," "lisinopril," "moexipril," "perindopril," "quinapril," "ramipril," "trandolapril," "spirapril," "zofenopril," "candesartan," "eprosartan," "irbesartan," "losartan," "olmesartan," "telmisartan," or "valsartan" AND "transplantation" AND "kidney" or "renal." A manual search for additional relevant studies using references from retrieved articles was also performed. The inclusion criteria were as follows: (1) RCTs published as original studies or conference abstracts that evaluated the effects of RAS inhibitors on kidney allograft survival, (2) studies that provided data to calculate relative risks, hazard ratios, or standardized incidence ratios with 95% confidence intervals (CIs), and (3) a reference group composed of patients who were on treatment with RAS inhibitors as control group. Two investigators (WC and CT) independently determined study eligibility. Differing decisions were resolved by mutual consensus. The quality of each study was evaluated using the Jadad quality-assessment scale  for RCTs and the Newcastle-Ottawa quality assessment scale  for observational studies. A standardized data collection form was used to extract the following information: Last name of first author, title of article, study design, year of study, country of origin, year of publication, sample size, definition of RAS inhibitors , and control groups, and outcome assessment period. The search strategy yielded 5204 potentially relevant articles; 4951 were excluded based on the title and abstract which clearly showed that they did not fulfill inclusion criteria in terms of article type, study design, population, or outcome of interest (Item S2). The remaining 253 articles underwent full-length review, with 248 studies excluded because they were not observational studies or RCTs (n = 45) or did not report outcomes of interest (n = 203). Five studies (3 RCTs and 2 cohort studies) with 20024 kidney transplant patients were included in the meta-analysis. [Table 1] and [Table 2] contain detailed characteristics and quality assessment of all included studies. The pooled risk ratio (RR) of allograft failure in recipients who received RAS inhibitors was 0.73 (95% CI: 0.45-1.21, I 2 =85%). [Figure 1] shows the forest plot of the included studies. We also performed a sensitivity analysis limited only to RCTs. The pooled RR of allograft failure in recipients using RAS inhibitors was 0.59 (95% CI: 0.20-1.69, I 2 =19%), as shown in [Figure 2]. Post-hoc meta-analysis assessing mortality risk was also performed. The risk for mortality was not significantly reduced in patients using RAS inhibitors compared to controls with RR of 1.13 [95% CI: 0.62-2.07]. Funnel plots were constructed to evaluate publication bias regarding the risk of allograft failure in recipients using RAS inhibitors. Overall, the publication bias was insignificant. In this current meta-analysis of a total of 20024 kidney transplant patients, we demonstrated no significant reduction in allograft failure risk with the use of RAS inhibitors after kidney transplantation. In addition, within the selected studies, RAS inhibitors did not improve survival in kidney transplant recipients. Although previous systematic reviews and meta-analyses successfully showed the effectiveness of RAS inhibitors in reduction of proteinuria in patients with kidney transplantation, ,, data showing a significant benefit of RAS inhibitors on renal allograft survival were lacking. , Despite growing evidence supporting the use of RAS inhibitors to slow progression to ESRD in nontransplant patients with CKD and proteinuria, , our meta-analysis found no significant benefit of RAS inhibitors use in renal transplant recipients. Recently, Knoll et al. conducted an RCT of ramipril versus placebo in 213 kidney transplant recipients with proteinuria. The investigators demonstrated a decline in proteinuria in the ramipril group. However, at 4-year follow-up, ramipril did not reduce the risk of ESRD or death in this population. A limitation of their RCT was that it was unable to achieve target sample size and was thus underpowered. The investigators had extrapolated observed event rates to a sample size of 528 kidney transplant recipients and the finding of their study still showed a nonsignificant difference in allograft survival endpoint. With more statistical power, our meta-analysis confirmed no significant risk reduction in renal allograft failure with RAS inhibitor treatment. This suggests that, if any RAS inhibitor effect is present, its magnitude is likely very small. Studies have shown a potential survival benefit with RAS inhibitors use in nonkidney transplant CKD patients,  especially with myocardial infarction. Unfortunately, this benefit from RAS inhibitors has not translated into the kidney transplant population. Recently, Opelz et al. 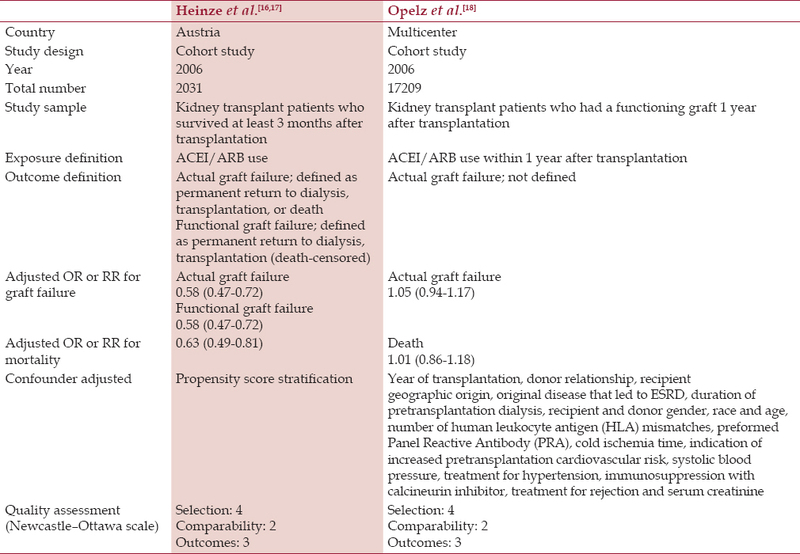 examined cardiovascular mortality in kidney transplant recipients by using Collaborative Transplant Study retrospective data. The investigators reported no difference in the cumulative incidence of cardiovascular death 2-10 years after kidney transplantation in patients receiving RAS inhibitors versus other antihypertensive medications. Thus, with the updated evidence and findings from our meta-analysis, the current recommendations by KDIGO clinical practice guideline  to use RAS inhibitors for hypertensive renal transplant recipients with proteinuria do not adequately address the long-term outcomes of allograft and patient survival. There are several limitations of the present meta-analysis. First, the objective of our meta-analysis was to assess allograft survival outcome. Thus, we did not evaluate the safety and adverse outcomes of RAS inhibitors in kidney transplant recipients. However, some of the safety outcomes have already been studied in previous meta-analyses. ,, Second, the majority of the included studies did not have available kidney allograft biopsy information, and consequently the cause of allograft dysfunction and/or failure was not known. Hence, even though RAS inhibitors did not provide a protective allograft benefit in the general transplant patient population, it is still possible that they may have a role in specific transplant subgroups such as post-transplant diabetes or recurrent/de novo glomerular diseases after transplantation. Further study is needed. Finally, although the findings from our meta-analysis do not support a potentially important treatment effect, there is no data to suggest that RAS inhibitors should be avoided in kidney transplant patient populations. In summary, this meta-analysis shows no significant reduced risk of allograft loss or mortality among renal transplant recipients treated with RAS inhibitors. Future studies that incorporate kidney allograft histology are required to evaluate if RAS inhibitors can provide potential benefits on long-term allograft survival in certain kidney transplant patient populations. Strippoli GF, Bonifati C, Craig M, Navaneethan SD, Craig JC. Angiotensin converting enzyme inhibitors and angiotensin ii receptor antagonists for preventing the progression of diabetic kidney disease. Cochrane Database Syst Rev 2006:CD006257. Hariharan S, Johnson CP, Bresnahan BA, Taranto SE, McIntosh MJ, Stablein D. Improved graft survival after renal transplantation in the united states, 1988 to 1996. N Engl J Med 2000;342:605-12. Meier-Kriesche HU, Schold JD, Kaplan B. Long-term renal allograft survival: Have we made significant progress or is it time to rethink our analytic and therapeutic strategies? Am J Transplant 2004;4:1289-95. Seeman T. Management of proteinuria in the transplanted patient. Pediatr Nephrol 2015;30:889-903. Amer H, Cosio FG. Significance and management of proteinuria in kidney transplant recipients. J Am Soc Nephrol 2009;20:2490-2. Hiremath S, Fergusson D, Doucette S, Mulay AV, Knoll GA. Renin angiotensin system blockade in kidney transplantation: A systematic review of the evidence. Am J Transplant 2007;7:2350-60. Knoll GA, Fergusson D, Chasse M, Hebert P, Wells G, Tibbles LA, et al. Ramipril versus placebo in kidney transplant patients with proteinuria: A multicentre, double-blind, randomised controlled trial. Lancet Diabetes Endocrinol 2016;4:318-26. Cheungpasitporn W, Thongprayoon C, Chiasakul T, Korpaisarn S, Erickson SB. Renin-angiotensin system inhibitors linked to anemia: A systematic review and meta-analysis. QJM 2015;108:879-84. Cheungpasitporn W, Thongprayoon C, Srivali N, O'Corragain OA, Edmonds PJ, Ungprasert P, et al. Preoperative renin-angiotensin system inhibitors use linked to reduced acute kidney injury: A systematic review and meta-analysis. Nephrol Dial Transplant 2015;30:978-88. Easterbrook PJ, Berlin JA, Gopalan R, Matthews DR. Publication bias in clinical research. Lancet 1991;337:867-72. Heinze G, Mitterbauer C, Regele H, Kramar R, Winkelmayer WC, Curhan GC, et al. Angiotensin-converting enzyme inhibitor or angiotensin ii type 1 receptor antagonist therapy is associated with prolonged patient and graft survival after renal transplantation. J Am Soc Nephrol 2006;17:889-99. Heinze G, Collins S, Benedict MA, Nguyen LL, Kramar R, Winkelmayer WC, et al. The association between angiotensin converting enzyme inhibitor or angiotensin receptor blocker use during postischemic acute transplant failure and renal allograft survival. Transplantation 2006;82:1441-8. Opelz G, Zeier M, Laux G, Morath C, Dohler B. No improvement of patient or graft survival in transplant recipients treated with angiotensin-converting enzyme inhibitors or angiotensin ii type 1 receptor blockers: A collaborative transplant study report. J Am Soc Nephrol 2006;17:3257-62. Philipp T, Martinez F, Geiger H, Moulin B, Mourad G, Schmieder R, et al. Candesartan improves blood pressure control and reduces proteinuria in renal transplant recipients: Results from secret. Nephrol Dial Transplant 2010;25:967-76. 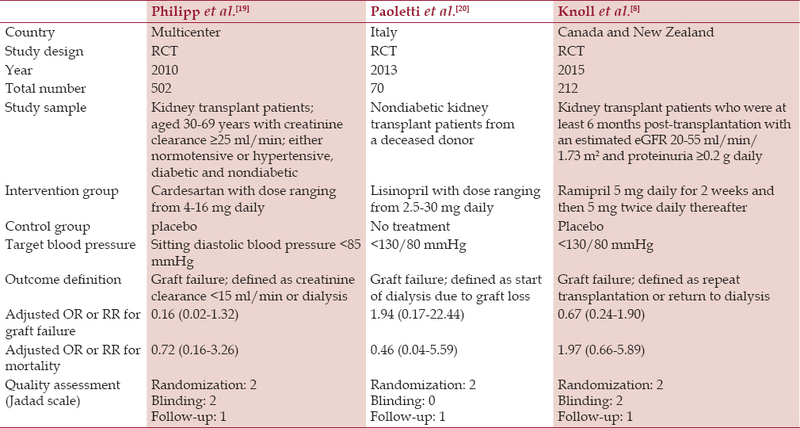 Paoletti E, Bellino D, Marsano L, Cassottana P, Rolla D, Ratto E. Effects of ace inhibitors on long-term outcome of renal transplant recipients: A randomized controlled trial. Transplantation 2013;95:889-95. Cross NB, Webster AC, Masson P, O'Connell P J, Craig JC. Antihypertensives for kidney transplant recipients: Systematic review and meta-analysis of randomized controlled trials. Transplantation 2009;88:7-18. Jennings DL, Taber DJ. Use of renin-angiotensin-aldosterone system inhibitors within the first eight to twelve weeks after renal transplantation. Ann Pharmacother 2008;42:116-20. Cross NB, Webster AC. Angiotensin-converting enzyme inhibitors-beneficial effects seen in many patient groups may not extend to kidney transplant recipients. Transplantation 2016;100:472-3. Toto RD. Transplantation: The role of raas blockade in kidney transplantation. Nat Rev Nephrol 2016;12:129-31. Molnar MZ, Kalantar-Zadeh K, Lott EH, Lu JL, Malakauskas SM, Ma JZ, et al. Angiotensin-converting enzyme inhibitor, angiotensin receptor blocker use, and mortality in patients with chronic kidney disease. J Am Coll Cardiol 2014;63:650-8. Evans M, Carrero JJ, Szummer K, Akerblom A, Edfors R, Spaak J, et al. Angiotensin-converting enzyme inhibitors and angiotensin receptor blockers in myocardial infarction patients with renal dysfunction. J Am Coll Cardiol 2016;67:1687-97. Opelz G, Dohler B. Cardiovascular death in kidney recipients treated with renin-angiotensin system blockers. Transplantation 2014;97:310-5. Kasiske BL, Zeier MG, Chapman JR, Craig JC, Ekberg H, Garvey CA, et al. KDIGO clinical practice guideline for the care of kidney transplant recipients: A summary. Kidney Int 2010;77:299-311.